The exhibition consists of paintings and drawings which reflect a personalized attempt by the artist to extract meaning from the abundance of information we experience through art, the media, and daily living. Chuck Hughes has recently received his Master of Fine Art at the University of Regina with a major in Drawing and a minor in Intermedia. He has exhibited across Canada and is currently working as the Audio Visual technician at the Alberta College of Art, where he graduated with a Bachelor of Fine Art in Printmaking in 1981. An exhibiting exhibition of Jill Paauw's contemporary jewellery opens at the Second Story Gallery on November 15th, 1984. The exhibit contains selected works made this year and it aims to show that a jewellery revolution is taking place. Attitudes to the function of jewellery have changed. There is less emphasis on wealth and status, more on creating an interesting personal environment. The material, which is not usually associated with jewellery, has surprisingly beautiful qualities. The varieties of texture, shape, and color will certainly impress anyone appreciative of the arts. And what a better place to display art than on the human body. A show with objects and paintings of an intrinsically foreign nature. In 2003, Sylvia introduced Artist Trading Cards to Regina. She continues to foster this activity. In 2008, with David Garneau, she formed Contrary Projects, an occasional, one-night exhibition/opening for new works. The shows take place in a domestic setting and are designed for discourse. There have been eight “projects” so far; at least two of which led to pairings of artist and curator and resulted in two solo shows in another gallery. Sylvia has had solo exhibitions at Calgary’s The New Gallery, Edmonton’s Harcourt house and the Dunlop in Regina and her sculptures, paintings, and installations have been included in numerous group shows. Sylvia’s studio production consists of miniature installations that incorporate sound and video. Recent work explores themes of urban paranoia. She is interested in our growing fear of the domestic other, our neighbours, and the creeping anxiety—fueled by a hysterical media—that our cocoons might be breached from without or within. Current projects concern humanities’ attempts to cope with environmental catastrophes. 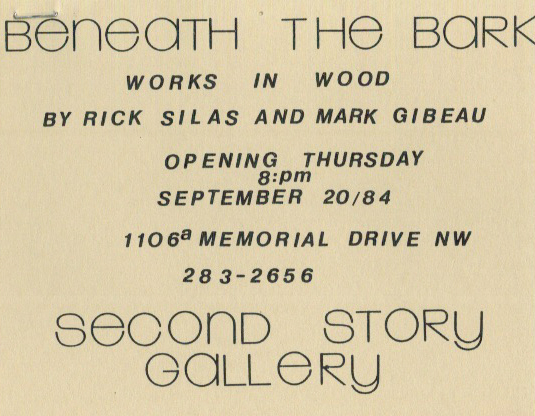 "Beneath the Bark - Works in Wood" is a showing of original and creative works in wood by Rick Silas and Mark Gibeau. Mark Gibeau's unique abilities and imagination have led him to his concept in the creation of wood turnings of immense proportions. The large size of these turnings make them distinctly original. Development of these creations has been achieved through many years of study and experimentation with wood. Rick Silas has studied for several years, first in Quebec and more recently in Alberta. His work deals with escape and growth, destruction of the old to make way for the new. He believes an artist's role in society is to reflect on the world around him. While in school, Silas devoted many hours to student governance, particularly ACA Autonomy politics. He has won awards for his leadership and dedication. Since leaving school in 1982, Silas has been a full-time working artist. The show consists of 13 drawings on paper as well as four free-standing pieces -- two in ceramic and two in metal. All drawings in this exhibition were done during 1984; based on thoughts and images, dreams and events that have affected the artist over this period of time. The free-standing drawing included are portraits of some close friends of the artist. Born in 1954 at Vancouver Island, British Columbia, Senini achieved his Bachelor of Fine Arts (honors) from the University of Victoria in Sculpture in 1975. He later received his Masters of Fine Arts from the University of Calgary in 1981. Senini is the recipient of numerous awards and has exhibited widely from 1972. "On a Scale of One to One" explores the metaphysical impocations intrinsic in nature, with an emphasis on the nature of physics. The engineering edication Jim received before studying at the Alberta College of Art is evident in the large wood and canvas structures. The integration of mechanical physics with the tradition of painting is quite complete and offers an "alternative to existential aesthetic that is not romantic." Jim Goertz graduated with a diploma in Painting from the Alberta College of Art in 1984. He has also studied at the Southern Alberta Institute of Technology in Mechanical Engineering Technology and Okanagan College in Fine Arts foundation. This is an exhibition of abstruse and lawless art, as yet never seen before in Calgary, by artists who hear, taste, feel, and push with their eyes. Homemade uncompromising films will also be premiered at the opening as well as impeccable, unburpable, muzik. 1942 ETC ETC ETC ETC? ETC! UOCH???????? ???!!!!!!!!!!! !! !! !!!! ! FInally decided to go to JUggling school and ,,,,,,,,,, acrbatics school..........got a Ph.D.
An exhibition of large, irregular shaped paintings on paper and canvas by Vancouver artist Victor Goertz. Vic Goertz was educated at the Okanagan College of Fine Arts and is a recent graduate of Emily Carr College of Art and Design in Vancouver. Vic is very much a painter, evident by his use of ultra rich surfaces and colour.